A lone surfer looking out at the sea. With the surfboard reflected on the wet sand. 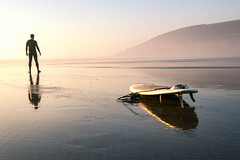 Saunton Sands, Devon, UK. On the warmest february on record. 27.02.2019.